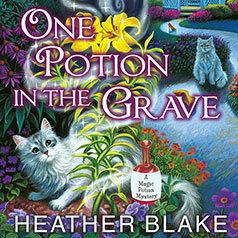 Heather Blake presents the second installment of her Magic Potion Mystery series. But before Katie Sue has a chance to voice any objections, she's forced to forever hold her peace. After finding her friend dead, Carly vows to find her murderer. Were the corrupt Calhouns willing to go to any lengths to avoid a scandal? Did Katie Sue's family take the term "bad blood" to a whole new level? And why did the bride-to-be come to Carly for a love potion? As Carly gets closer to the truth, a killer is planning a very chilly reception . . .